The gold has to melt itself in fire to remove impurities and then get casted in shape of desire and ultimately polished to achieve glitter –to make it a jewel... so should a man also to achieve outstanding success! No wonder, entire, range of SICO jewellery manufacturing machines such as gold jewellery casting machine, gold melting furnace, hallmarking machine, laser cutting and laser welding machines are exported worldwide and are popular in Dubai, Sharjah, Bahrain, Abu Dhabi, Muscat, Oman, Doha but also in London, New York, Sudan, Tanzania, Nairobi – to name a few. Since beginning, SICO industries has been recognized for it's machine quality, workmanship and goal of customer satisfaction. SICO is an ISO 9001:2008 certification as well as NABL accreditation & achieved the CE mark in 2012. 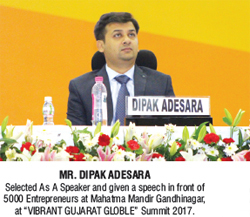 The Company's CEO Mr. Dipak Adesara is taking the organization to the next level by his knowledge of contemporary jewellery manufacturing techniques and expertise in reducing loss of gold as well as power consumption in whole process, minimizing human errors and complete training for efficient production – getting invited as consultant and key speaker in exhibitions, seminars and vibrant summits organized by the government and industrial associations. SICO today, not only is an established leader in the Gold manufacturing supply segment, but has largely been able to synergise experience and expertise with young minds and ideations. 1. "LOSS OF GOLD" - How To Reduce The Loss Of Gold ? 2. "HUMAN ERROR" - How To Reduce Human Error ? Technology With Human Resource (skilled Or Unskilled Employee). 4. Concept Of LEAN MANUFACTURING In Jewellery Industry. 5. 6 SIGMA And 5-S CONCEPT In Jewellery Industry.